You already know you need a better way to handle carton storage and improve ordering picking operations – from better space utilization to more ergonomic, productive order selection, carton flow is the obvious choice. The next step, determining which system is best for your application, can be a far more daunting question and critical to carton flow system performance. Your first step is to have a good understanding of your inventory requirements. Are your carton sizes relatively consistent or do they vary by SKU? Do SKUs, carton types and sizes change frequently? Is system re-slotting a concern? Armed with these answers, your decision will be far easier. In general, carton flow systems are grouped in two major categories; systems designed for consistent carton widths and those designed for varying carton widths. 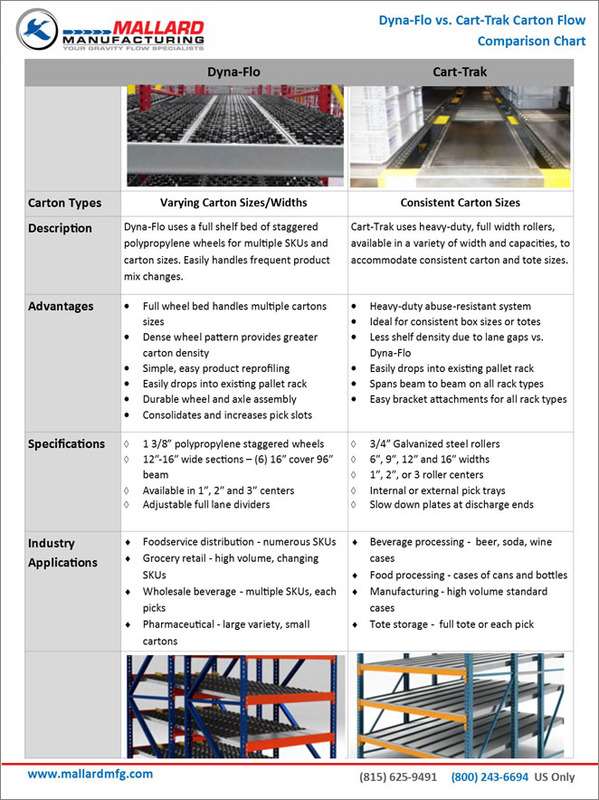 Using two of Mallard’s leading carton flow systems for comparison, refer to the chart below to see which system is the right fit for your application. If you’re still not quite sure, call one of our carton flow pros for some expert advice. Call for carton flow selection advice or a quick budgetary quote. We can also test your cartons in our in-house testing lab or provide a test level in your facility.